When we think of Hot Rodders, we think of early Fords wearing furious modern V8 with blistering accelerations. So what happens when electricity steps in? While the electric vehicle, EV and plug-in hybrid, PHEV market is fairly new, one market waiting to explode is the EV Tuning one. After all, we have tuners for just about any type of internal combustion engines, ICE, so why not EVs and PHEVs? It’s happening, slowly but it is happening. Hence another team in Boca Raton called High Voltage Hot Rods converting classic cars to electric performance vehicles. As usual, they started working on a few cars and today have an official shop. High Voltage Hot Rods. While seemingly an oxymoron at first, High Voltage & Hot Rods are two things rarely associated but it is a matter of time before they do. Think about converting a ‘66 Corvair, or a ‘66 Mustang and even a ‘57 Thunderbird to electricity. Either using an actual collector car, a kit car, or reproduction the (re)new vehicles show muscle car performances, such as sprinting the 0 to 60 in as little as 5 seconds but all of it on cheap electricity. An Electric Classic. I met a person who had done what every teenager wishes he could, take a classic 70s racer and DOT it for street use. This person was driving a Lola T70 on the streets and having a great time with it. Now how about putting an electric drivetrain on it? The racing and futuristic lines of the T70 would marry themselves well with an electric propulsion system. High Voltage Hot Rods decided to tackle another race icon of the 60s, a 1968 GT-40 replica. Now called the EVGT-40, this EV is driven every day using 54 individual lithium batteries for a total voltage of 180. The $10,000 lithium battery pack lasts about 10 years according to the shop but obviously requires no oil changes or tuneups, an electric motors just spins constantly at full torque efficiency. What were the costs to convert this boyhood dream of a vehicle to electricity? $20,000 to $30,000 for a vehicle that covers 120 miles on a charge for about $3. It’s a bargain even you consider the replica car cost. Possible Donors. Conversion donors are aplenty and the choice is yours. How about digging up one of those cars many used to laughed about back then but make for great second life, affordable and cheap cars to operate, such as a Chevy Geo Metro. They make great platforms for an electric conversion. 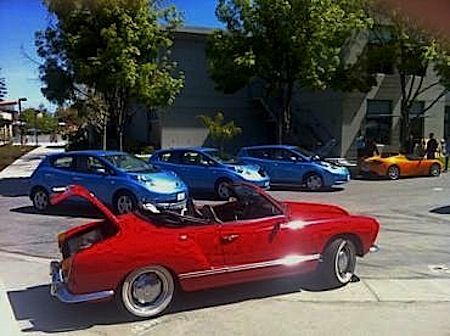 Our very own David Herron has converted his VW Karmann-Ghia to electricity and plenty of other 70s fun car could be switched electricity for less money than a restoring and running a classic in the long run. Increasingly we should start to see shop popping here and there helping you get rid of those yesteryear inefficient gasoline engines for leaner and torquier electric motors. Which affordable classic can you think of giving back a lease on life with electricity? I think there's a couple angles to this. One is what you say - the guys taking an old car and hopping it up with better performance and restoring it. There are plenty of small companies around the U.S. selling the parts for electric conversions, and in many cases their focus is high power parts for people building electric cars for NEDRA (NHRA-sanctioned) drag racing. Another angle is performance parts for the manufactured electric cars. I know less about this market and don't know of any examples. FWIW, John Wayland (the owner/builder of the White Zombie) got started with electric cars as a hotrodder who caught the electric bug.